While the debate over the merits of blow off valves (BOVs) is sure to continue, what remains is (as was so eloquently said by someone), those that have them, love them; those that don't, simply don't understand. Check out the FAQ section for a detailed explanation of the theory behind blow offs. They essentially replace the existing recirc valves and in the process add a very cool 'pssshhhh' sound when shifting. 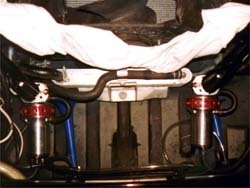 BOVs are made by several of the big manufacturers such as HKS, Greddy and Blitz. 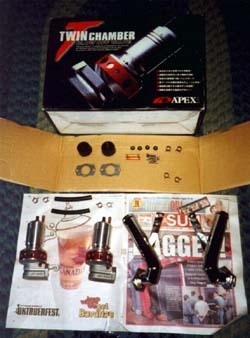 This install covers the installation of the APEXi BOVs (1.). I chose them due to both the low price, and the distinct look. They may not be as loud, or as high pitched as some of the others, but they work well for me. 1. Remove the factory re circulation valves. 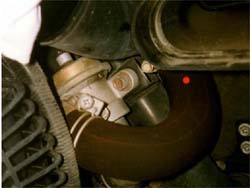 Use steps 1-7 of the TwinPOP Installation TECH to remove them, it covers the passenger side recirc valve. The procedure is the same for both sides. This does not cover the (unlikely) possibility of having the stock air box in place. If this is the case, reference K&N TECH for details on removing the stock air box. 2. Plug the holes in the intake piping with the rubber stoppers included in the kit. The hole is where the other end of the hose coming out of the stock recirc valve is going to (red dot in 2.). 3. Start assembling the BOVs. First attach the small hose (green dots in 3.) 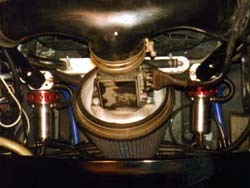 between the two fittings on the BOV. Remember to put the hose clamps on the tube before pushing them on the fittings. Put a little WD40 on the fitting, it makes it MUCH easier to put the rubber hose on. Bolt the chrome tube to the BOV (4.). Remember to put in the gaskets supplied in the kit. Note: while the diagram included in the kit shows the bolts going in one direction, they must go in the other (the nuts simply won't fit on the BOV side). Now put a copper connector in the end of one of the long hoses (don't forget the hose clamp) and the other end of the connector to the small vacuum line pulled out of the top of the recirc valve (removed in the second part of step 7. in the TwinPOP Installation TECH) to extend the lines. 4. 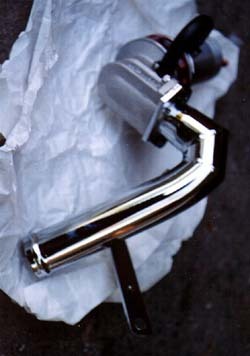 Push the end of the chrome tube into the lower tube that looks like it's coming from the engine and tighten the clamp. Connect the mounting bar on the chrome tube to the recirc valve mounting hole closest to the front of the car. On the passenger side, take care not to gouge the A/C lines. The lines rubbed against the brace on my car, so I *carefully* bent the brace where they didn't rub anymore. The A/C tubing is soft aluminum, so the brace would probably gouge a hole in the line. Not good! Other cars/BOVs might fit differently. Finally, push the end of the long small vacuum line onto the front end of the BOV (blue dot in 3.). Don't forget the hose clamp! Repeat on the other side. 5. 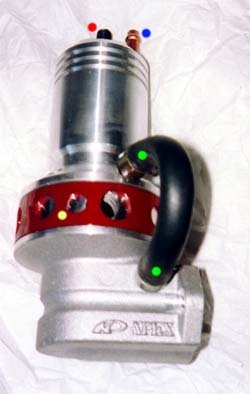 The installed valves should now look like this (5.). Turn the red dials to adjust the sound (yellow dot in 3.). Supposedly, the smaller hole is louder. 6. Adjust the pressure release spring tension by using a hex key to twist in the screw (5 mm hex wrench, red dot in 3.) on the end of the BOV, there is a 12 mm lock nut to loosen first. I was able to hit full boost without any adjustment, but according to APEXi, the screw should only protrude 2-4mm. Experiment with it, just keep in mind the further the screw goes in, the higher the boost required before the BOV releases pressure. Too little spring tension will cause erratic boost response. WARNING: A tight valve results in better boost response between shifts, but may cause some excess boost pressure to flow back to the turbos. Tightening the valve too much could potentially damage the turbos through compressor surge (see Z32FAQ on merits of BOVs). 7. Reinstall the filter & panel and it's done! (6. ).